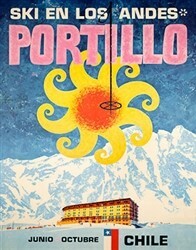 1970’s Steamboat Barn skiing poster is still as hot as it was years ago. 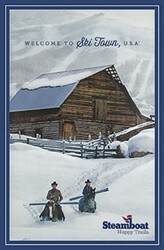 This Ski Poster says it all about Steamboat and is one of Steamboat’s first Ski Posters. Billy Kidd won a Silver Medal at the Innsbruck Olympics in 1964. He is the Ambassador of Steamboat and has been for many years. 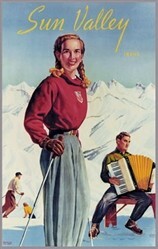 Some skiers go to Steamboat to get to ski with Billy. 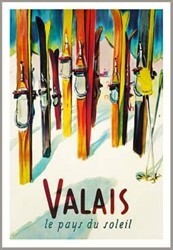 The man in the Ski Poster (front rider) is Earle “Rusty” Chandler, Jr. Rusty, who now resides in Warren, NH. After leaving Steamboat for his native NH in 1979, he became the director of skiing at Mt. Sunapee Ski Area, then eventually had to retire due to the Parkinson disease that caused him to leave Colorado in the first place. Rusty has lived with this disease for more than 30 years, a remarkable feat.